The Eventide H910 is an incredibly faithful recreation of the legendary H910 Harmonizer used on countless records by John Lennon, U2, Frank Zappa, Led Zeppelin, Bon Jovi, AC/DC, David Bowie, Van Halen and much more. 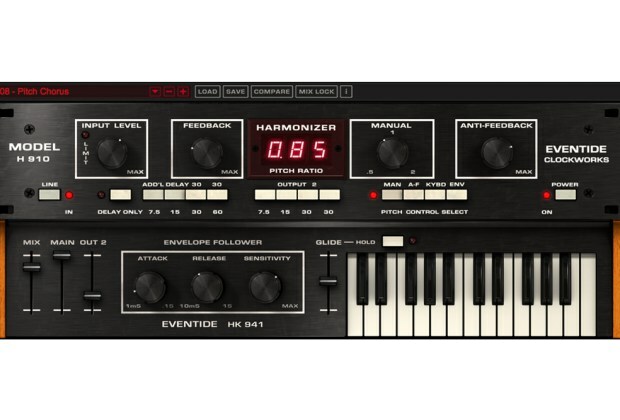 The Eventide H910 Harmonizer, part of the Anthology bundle, is now available as a separate Native plug-in ready to be enjoyed for its unique combination of pitch shifting, modulation and delay. The H910 is useful to double and spread out guitars and vocals, fatten snares, de-tune synths or add harmonies or slapback delays to vocals. It’s easy to get freaky mechanical sounds, drone effects or robotic language using self-oscillation, delay and anti-feedback controls as found on the original hardware unit. You also get the H910 Dual Harmonizer, which recreates the popular technique of running two H910 units in parallel with their outputs panned left and right to create lush doubling and stereo-widening. There is also the MIDI mapped H910-EKD version that has an onscreen recreation of the original piano-style keyboard remote controller that allows you to play musical pitch offsets and blend in a second delay output by using the new mixer controls for added stereo sound. The new envelope follower uses the input signal to bend the pitch slightly (or massively) for wild harmonizer effects the H910 is known for. The H910 plug-in sells for $249 MSRP. Rudolph, Barry. "Music Gear Review: Eventide H910 Harmonizer Plug-In." Music Connection Magazine. 2016. Accessed September 02, 2016. http://www.musicconnection.com/music-gear-eventide-h910-harmonizer-plug-in/.